Rising up to the sun rays hitting snow clad peaks of barren mountain, sipping hot lemon ginger tea admiring the mother nature; eating delicious breakfast under deep blue sky, the scenic stroll around lush green meadows,non-stop family talks and chairlift journey to the meadows are some of the golden moments which I can recall from my recent trip to Auli and stay at the Auli Resort – The Royal Village. Auli Resort- The Royal Village is a cool environment-friendly holiday resort and is located at one of the most picturesque locations. It lies within the complex of GMVN (Garhwal Mandal Vikas Nigam), giving the panoramic view of majestic Himalayan ranges. After a long drive and trip to Badrinath Dham and the Mythical Mana Village, we thought of rejuvenating our body and soul with the fresh air and serene beauty of Auli. As soon as you reach Auli base, GMVN resort welcomed us. But somehow it didn’t attract us and far away the rowed yellow log huts with the green background were too enticing. 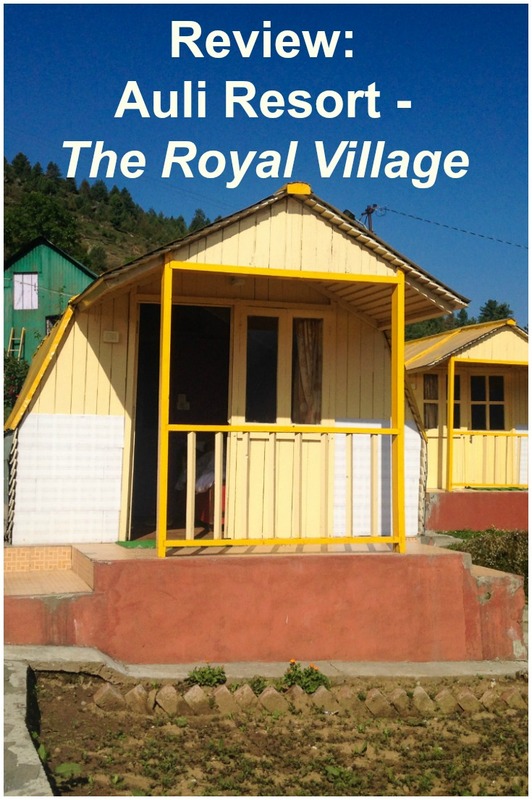 That was the Auli resort – the royal village. It’s hardly a 100 meters drive or walk from GMVN. The reception is simply done with a seating and few Himalayas and trekking books are around, in the shelves. The staffs behind the desk are super friendly and they helpful you while checking in and assist you to your rooms. They too guide you about local sightseeing and how weather changes in Auli. Read here for the different shades of Auli in summers. There are 12 luxurious huts in two rows lined one behind another on the mountain slope, each having its own patio facing towards the snow covered mountain peaks. The Auli resort is a perfect place to soak in the mountain atmosphere. 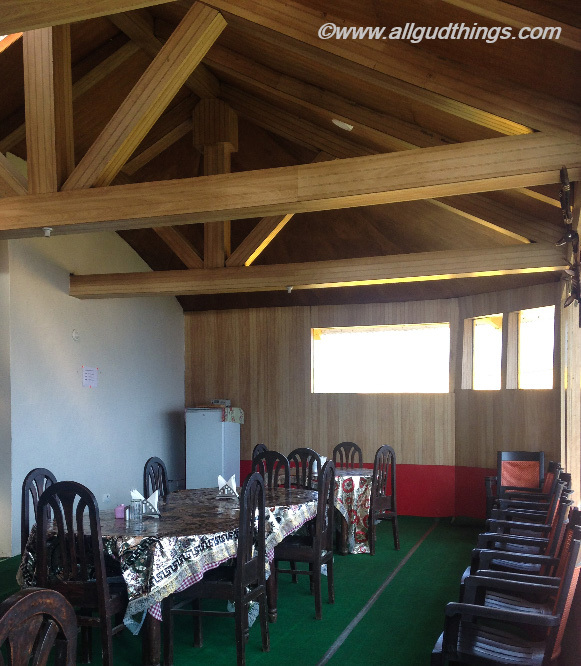 The rooms are designed keeping in mind the extreme winters at Auli and they are comfortable for summers too. The maximum temperature in Auli goes around 16 degree Celsius in summers and in winters the lowest can be up to -8-degree celsius. 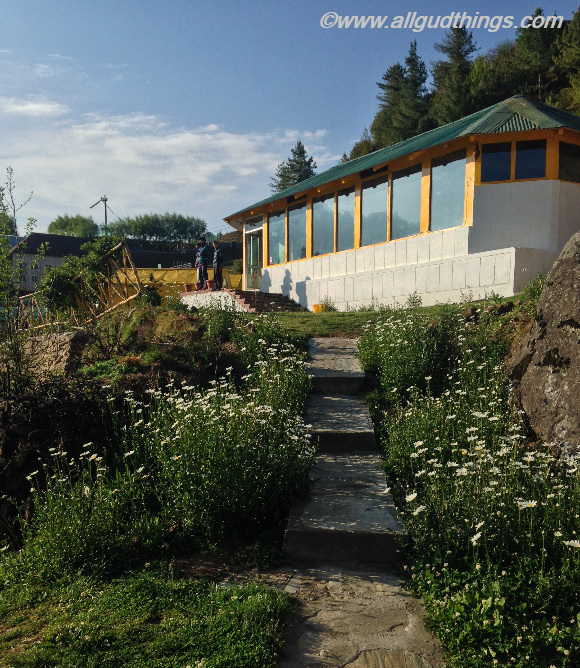 The Auli resort huts are colorful, clean and cozy. The hut in which we had put up was painted in purple and white and there was a separate space for bedroom, dressing room, and washroom. 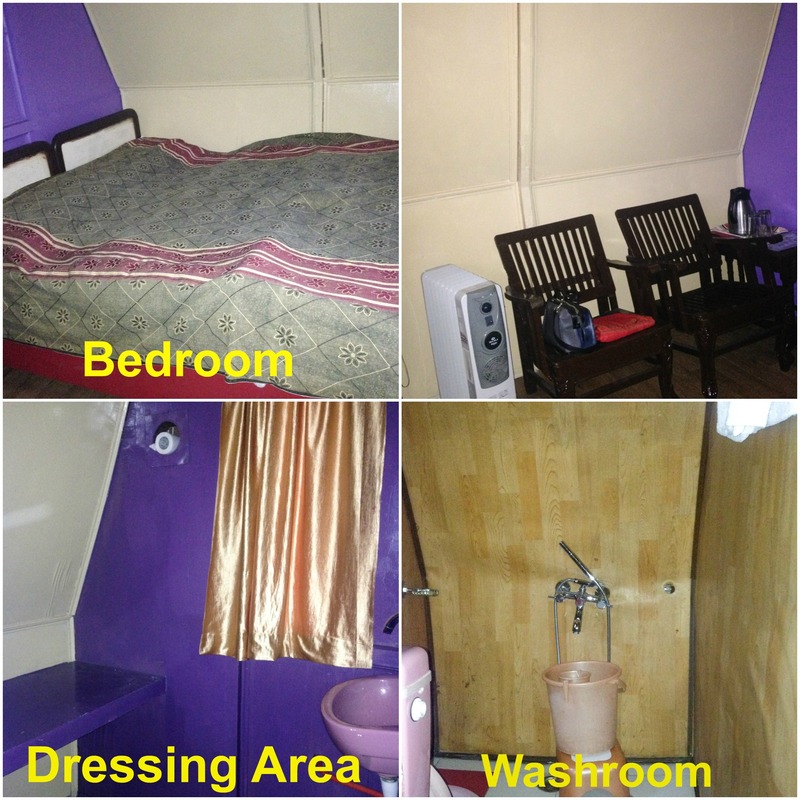 The room has all basic amenities like television, chairs, room heater and tea-coffee maker. And yes! 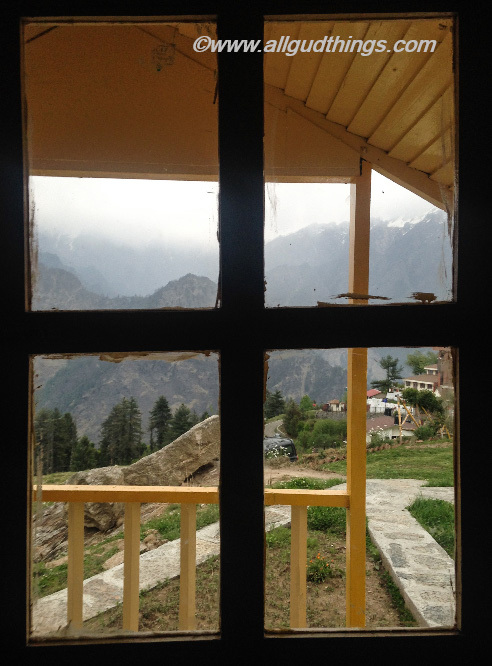 The views from the window of the hut were just not Wow but spectacular –Almost half of the Auli was visible. One cannot stroll or enjoy without food and there is no worry when you are at Auli Resorts – The Royal Village. They have a variety of Indian, Chinese, continental and some local dishes in their menu. We tried Indian, Chinese and Uttarakhand’s local food. Everything was just scrumptious. The dining area behind the reception is clean. It has wooden roofs, giving the typical feel of a place in mountains. The Hanuman Temple: It lies just after a refreshing trek of 15-20 minutes from the royal village Auli Resort. The Panoramic View of Snow clad Mountain Peaks: From the resort itself complete panorama of majestic Himalayan peaks is visible and the prominent are Nanda Devi, Chaukhamba, and Panch Chuli. Gurso Bugyal Meadows: The Meadows lies 3kms from Auli resorts and are spread amidst forests of oak and conifers. They turn lush green in summers and are snow covered in winters. So, if you love winters sports you surely cannot miss visiting Auli as a winter destination in Uttarakhand. One can try skiing, ATV rides, and others sports here. There are enough parking spaces available around Auli Resorts. I will say the Auli resort lives up to the name of Auli and is a complete value for money. We paid Rs. 3000/- per night. The colorful huts, delicious food, impeccable services, and beautiful views – everything is perfect here. The place not only relaxes your mind and body but make you feel in the abode of heaven. One can get the huts booked at Auli resort from MakeMyTrip, Tripadvisor or Booking.com. The Gondola Chairlift is only 100 meters away from the Auli resorts. The resort arranges day treks, only on prior information. Auli resort is a good place for families, friends, and couples. The huts look like a cozy room with a view. I think I would enjoy sitting on the porch. Looks like a very nice place to stay and with cable cars near by, even better. Happy travels. Great views and looks a perfect place as a base for trekking. The Royal Resort looks charming. The best thing is it seamlessly integrates with the surroundings and landscapes. A nice place to base your adventures in Auli. I would love to get there when there is snow around and get some skiing done. That is such a spectacular view of the mountains. I like that its an environment friendly resort where you can admire nature.I would love to visit Auli someday! I had not heard of this resort before now. It is very beautiful. I love that there are only a small number of huts, makes it looks really exclusive! Love those yellow roofs! The views are spectacular and the fact that it’s environmentally-friendly makes it a win win! Auli Resort looks like a must visit! It’s adequately spacious and can hold parties too i guess! Wouldn’t mind staying there just for that snow-capped mountain views. Simple, back to nature fun. Wow, those are quite idyllic views. Would love to visit Auli resort and go for a hike 🙂 Great review! I love the views, especially as seen in the first panoramic photo! How hard/far is it actually to travel here from the nearest major town/airport? No matter how far it is, I’m sure it’s worth it – especially with that kind of views. Would have loved to see some photos of Gurso Bugyal Meadows, by the way! Sounds intriguingly beautiful! Such a good location for this resort. The panoramic views of those snow peaked mountains clearly is the icing on the cake! Peaceful and lovely are the words that come to my mind after reading this. I love the homely feeling this resort gives. Gurso Bugyal Meadows looks amazing from here. What is the average rate per room here? Those mountain views are spectacular! Wow! The resort looks like it’s basic but perfect for budget travellers. I had planned a trip to Auli and it got lost somewhere. Thanks for bringing it back. Nice resort as well with a nice view. That is an absolutely picturesque view from the village looking over the mountain side. What is the best way to get to this wonderful spot and how to get around? From Delhi one can take a flight to Dehradun. and then ahead a cab till Joshimath or Auli. Or second option is you can directly hire a cab from Delhi to Auli. Auli is a small place. you can walk around, take treks and use chairlift to reach meadows . The location of the resort looks perfect! I love the bright yellow in the midst of nature! It looks simple and elegant! At just 3000 bucks I think its totally worth it, just the view itself is worth it! The best thing I live about this resort is the beautiful panorama over the mountains. I would stay there just for that view. I bet it is a wonderful place to stay at if you are looking for a few days to relax away from the noises of the city. Looks nice and relaxing. I’d definitely want a view to enjoy some snacks and a drink and breathe in some fresh air! I really like the way you wrote your article and I definitely love the pictures. You made me want to enter a plane right now. Auli resort looks like a perfect getaway to unplug from the rest of the world and spend some good time! The view from the room’s window is quite breathtaking! The location looks absolutely fabulous! The idea of sipping hot ginger tea while looking out at the mountains in the distance really wants to make me head for a holiday right now. Great post! What great budget accommodation and the kitchen sounds like it is very varied with their dishes. That view of the mountains is outstandingly beautiful. This looks like a lovely place to stay and a great place to relax after a day of skiing or hiking. I like there is a good choice of dishes available too. 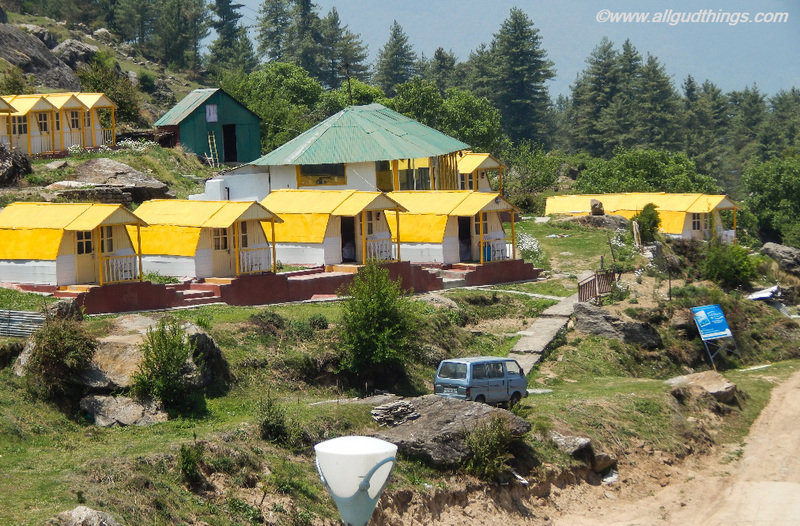 Auli Resort looks like a cute place and for a great price too! The views of the mountains from your room were absolutely amazing. Would love to visit the Himalayas sometime soon! Wow!!! You must have amazing views at Auli Resort! Those luxurious huts remind me of glamping that I did last year, but I stayed in mobile homes. Views of Himalaya!! Superb! The little huts are such an interesting accommodation. But I love how they’re all separate from each other. Like you have your own little house.